As I’ve explained a million times before, the most important part of every single weight loss diet is creating a caloric deficit. This is when you consume fewer calories than your body burns (or burn more calories than you consume, it’s the same thing). Doing so puts your body in a state of negative energy balance, where it doesn’t have the calories it needs to perform all of the daily tasks it needs to perform (moving, breathing, digesting, exercising, etc.). So, in order to perform those tasks, your body is forced to burn your own stored body fat for energy instead. As a result, you lose weight (or more specifically, you lose fat). This is why a calorie deficit is the absolute key to weight loss. Creating the caloric deficit you need to lose weight at the ideal rate is something I’ve already covered in detail right here: How Many Calories Should I Eat Per Day To Lose Weight? What I want to do now is cover how I arrived at that amount, why it’s the deficit of calories that I (and most experts) recommend, and what makes it so ideal in the first place. Doing it all in a way that is as doable and sustainable for you as possible. Knowing this, there are typically 3 different categories of “sizes” that the deficit can be: small, moderate, or large. With a smaller sized deficit, everything is at its easiest in terms of doing it and sustaining it. Since the amount of calories being reduced is so low, the fewest dietary changes are required. This means pretty much no issues with hunger and mood, less metabolic problems, and little to no impact on training and recovery. Not to mention, the potential for muscle loss is at its very lowest. On the downside however, the rate of weight loss will be at its lowest as well, and that’s a pretty big CON for most people (who typically want to lose weight as fast as humanly possible). So, by reducing your daily calorie intake by too little, you end up losing weight at a rate that can be viewed as unnecessarily (and unbearably) slow for most people. With a larger sized deficit, the rate of weight loss will be at its highest, and that’s something that probably appeals to just about everyone looking to lose weight. However, that’s where the PROS stop and the CONS begin. The fact that it requires such a big calorie reduction makes it by far the hardest to do and sustain (due to hunger, mood, metabolic issues, etc.). A large deficit will also have a large negative impact on training and recovery (among other things), and that increases the potential for muscle loss to its highest level. So, by reducing your daily calorie intake by too much, you end up unnecessarily putting yourself in the hardest (and most unpleasant) position to achieve successful long term weight loss. With a moderate sized deficit in the middle of the previous 2 extremes, you pretty much get the best of both worlds while greatly lessening (or completely eliminating) many of their potential drawbacks. And, while each of the 3 different size deficits can indeed have a place in certain situations, my feeling (and the feeling of most others) is that for most of the people, most of the time, a moderate sized caloric deficit is the best choice for losing weight successfully. 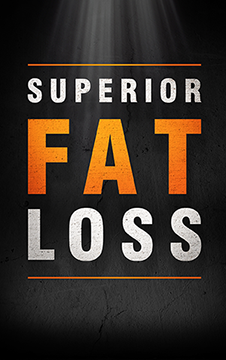 You’ll end up maximizing fat loss, minimizing muscle loss, and doing it in a way that is the perfect combination of easy, fast, sustainable, and enjoyable. It’s the size that I most often recommend. So, What Is A Moderate Sized Deficit? Once again, this is a question I’ve already answered in full detail right here: How Many Calories Should I Eat Per Day To Lose Weight? The quick version is this: the most common recommendation for a “moderate” sized calorie deficit is being 20% below your calorie maintenance level each day. Don’t worry, my previous post explains exactly what that means and shows you exactly how to do it. Why is the ideal caloric deficit based on a percentage of a person’s maintenance level and not just a fixed amount? Quite simply, a percentage based deficit will ensure that the calorie deficit created matches the degree of “fatness” of the person creating it. See, a lot of people like to just recommend the old standby “500 calorie deficit each day.” In fact, I was always one of those people and sometimes I still am. It’s a pretty solid size for a caloric deficit to be, as 1 pound of fat contains about 3500 calories. So, if you created a 500 calorie deficit each day, you’d create a total deficit of 3500 calories per week and should therefore lose about 1lb of fat per week. This sounds nice and simple in theory, but, it has one small flaw. It causes everyone to create the same size deficit and lose weight at the exact same rate regardless of their exact situation. Meaning, some people have a lot more (or a lot less) weight to lose than others. And, when you think about it like that, it seems a little silly to have someone with 10lbs to lose create the exact same size deficit as someone with 100lbs to lose. With the “create a 500 calorie deficit each day” recommendation, that’s exactly what happens. On the other hand, since a percentage based deficit relies on each person’s own calorie maintenance level to set the amount, the deficit created will be in direct proportion to the amount of weight that needs to be lost by each individual person, and the means the rate at which they lose weight will be in direct proportion as well. 2000 calories per day 400 calories below maintenance. 3000 calories per day 600 calories below maintenance. 4000 calories per day 800 calories below maintenance. As you can see, someone with a higher maintenance level (and therefore MORE fat to lose) ends up creating a larger deficit than someone with a lower maintenance level (and therefore LESS fat to lose). So, the size of deficit is in direct relation to the amount of fat that needs to be lost. People with more weight to lose SHOULD lose it at a faster rate than someone with less weight to lose. With a percentage based deficit, that’s what ends up happening. People with more weight to lose are less likely to lose muscle due to the higher abundance of fat on their body. Therefore, they can handle a larger deficit and faster rate of weight loss without the same risk of muscle loss (assuming they do everything else right, of course). Similarly, people who are leaner or just have less weight to lose are at a higher risk of losing muscle. Because of this, they SHOULD have a smaller deficit because they SHOULD have a slower rate of weight loss. With a percentage based deficit, that’s what ends up happening. So, everyone wins. Regardless of how much weight you need to lose, a deficit of 20% of your current maintenance level will usually mean everything is happening in a way that’s best for YOU and YOUR exact situation. And that covers how and why I (and many others) came to recommend 20% below maintenance level as being the ideal caloric deficit to use when setting your calorie intake for weight loss.